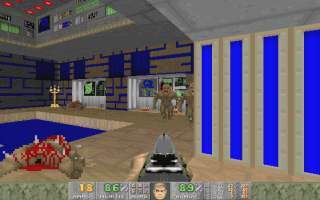 CLASSIC1 is a medium sized level for Doom 1, in the Shores of Hell style. The architecture is really good; it keeps the simplicity of Doom 1, but makes the areas very interesting as well. There are lots of features like computer panels, crates, acid, stairs, and lighting. Also there are many windows and tunnels between areas, and a good stone and tech texture theme. There are lots of good fights too. Early on mainly the basic Doom 1 enemies are used, imps and shotgun men, but ammo is tight; in particular, you have to be careful with weapon selection. There are lots of good traps throughout the level, and a good variety of traps too. It's very fair though, you never get caught by anything too deadly. It's definitely a very non-linear level, but the route always followed naturally, so I never had far to go to find the next area to attack. Overall, a great Doom 1 level, which I have no hesitation in recommending to you all :-). classic1.zip, size 49kb, date 1998/7/12. CLASSIC1.WAD, size 138kb, date 1998/7/12. classic1.txt, size 1kb, date 1998/7/12.